It is strange what sometimes comes to mind in the early waking hours of the morning. Today Tim and I were mentally going from room to room counting our chairs at 6: 37 a.m. We got to 41, but that was with a couple stretches of the imagination – like the old milk can that sits in the pantry. Borrowing folding chairs is always an option but there’s enough to do before a house concert without carting chairs around – especially in the cold winter months. In June, 2012 at Lancaster’s First Friday while we were visiting an antique store on N Queen Street, I discovered 2 beautiful church pews on the second floor which were a) very heavy and b) very expensive. The shop owner brought the price down, but not the weight. We left without buying the pews, planning to visit again with some more muscle and a pickup truck. Considering varying sizes of bottoms, we estimated at least 12 people could fit comfortably on these 2 pews. And, there were hymnal racks should the evening call for a rousing chorus of “Power in the Blood”. During the early morning counting process the pews came up again in conversation and it was determined that some additional searching was necessary. We found nothing at Shupp’s Grove (except for some really cool photography trays that I would like for the darkroom that I’ll never have since we bought a house filled with skylights) so we drove to Renninger’s. Bingo. Outside there was a vendor with very few items, some of them displayed on a bench. Upon further inspection I noticed it was a folding bench. Not getting too hopeful I asked…”is the bench for sale?”. Yes! And there are two more just like it. The history is that these benches (over 40 of them) were used in a park for concerts and shows. They were then purchased by the vendor’s auctioneer father for seating at auctions. 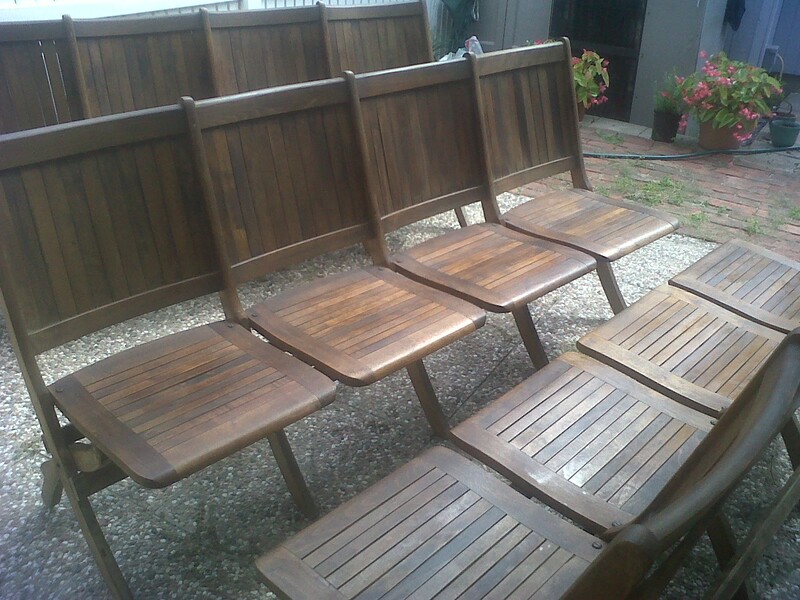 No longer needed for the auction house, the benches are sold individually. 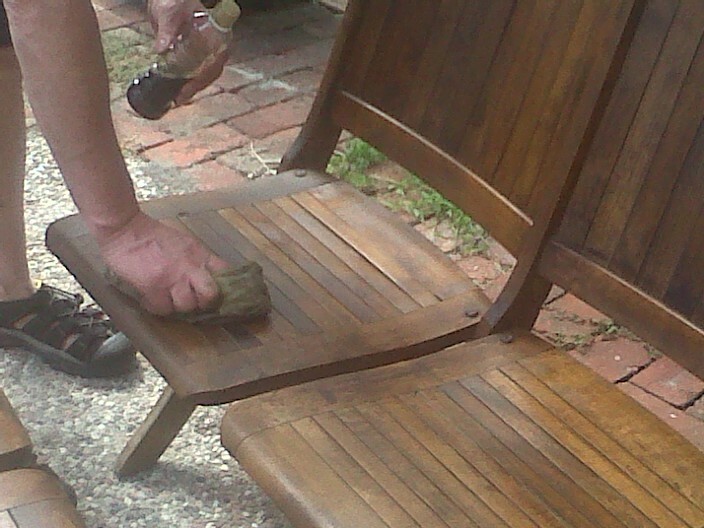 Maybe you’ll get to try out one of these benches at the upcoming Barn Birds house concert on October 3, 2012. If not, there are 41 other options – including the milk can. Nice! How many did you buy? Where do you store them in between concerts? Anne, we picked up three of them so that adds 12 seats to our concert venue. The chair sections and seats fold up easily. We can store them in the basement. What a fantastic idea and offering to the community! The concert is intriguing and I will put it on the calendar. Hi Sheri – You are welcome to join us for the Barn Birds concert – People are invited to arrive any time after 6:15 with a food/beverage to share if you’d like – the show will begin at 7:00. They’re a little bit country, folk, with touches of bluegrass and a hint of rock & roll (Jonathan anyway). If parking it tight on the street, you can turn left on Nevin – there’s almost always parking on the side street, or in the parking lot on Nevin on the left for Sacred Heart. Shall we save you a seat?